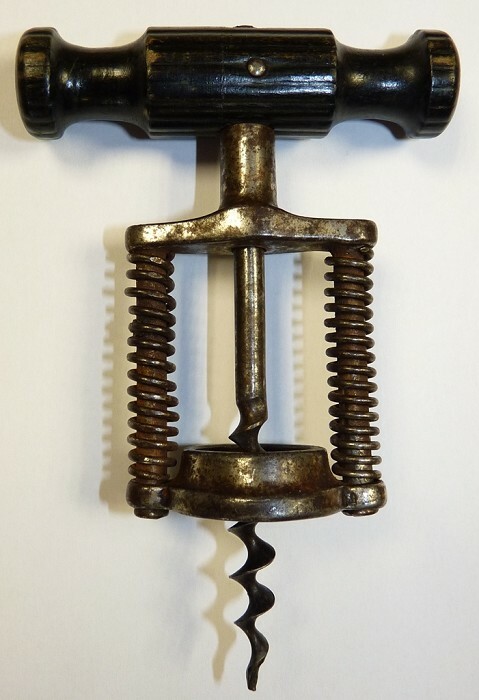 Rare German dual spring frame corkscrew, registered in Germany by Carl Ulrich on January 17, 1895. Marked on the top of the frame "D.R.G.S." instead of the more common D.R.G.M. The letters "D.R.G.S." stands for "Deutsches Reichs Gebrauchsmuster Schutz" (See Peters, Mechanical Corkscrews, page 243). See Peters, "Mechanical Corkscrews", pages 108 and 243 and "German Corkscrew Registrations", page 20. Condition is very good and consistent with age, retains a good amount of original plating, light surface corrosion could easily be cleaned depending on preference. Worm has a little very old tip damage (does not spoil, see photo). UK - Special Delivery £8.49, Europe Royal Mail Int. Sign £10.50, Rest of world Royal Mail Int. Sign £13.10. Other postage options can be arranged with additional insurance. Paypal or Personal cheque for UK buyers. For payments over £500 bank transfer preferred.